Have you ever completed a project only to have the client call you and ask why there aren’t stakes driven into the corners of their property. Weren’t they also supposed to get hard copies of those CAD drawings? Don’t they get to keep the photos you took with your drone? In full color? Now you are going back and forth, and your costs are creeping up. You might start giving away valuable deliverables to keep the client happy. Or you have an angry client swearing they will never work with you again. This problem can be avoided with a strong, clear proposal. Here’s a bit of advice: treat writing a proposal like drawing up a contract. It serves as documentation of what you and your client agreed upon. What are the elements you need to craft a strong proposal that will serve as a bulwark against confusion? Scope, deliverables, and Profitability. This is where you spell out exactly what work you are going to do and, in some cases, what you aren’t going to do. (These are called exclusions and will be covered in another post.) Too often assumptions are sketched out on the phone or over email and don’t make their way into writing. It’s easy to forget what you talked about three weeks ago. Remember you are communicating with a client who isn’t necessarily in your industry. When you say, “determine bridge footing location,” they might hear “provide perfectly rendered architectural drawings of a bridge that solves all engineering challenges.” Try to avoid jargon or define your terms. Include minor details that seem obvious to you. They might not be obvious to the client, and they help explain the costs of the project. While it might seem second nature to you that you start with a title search, a client might not necessarily be aware that that is an important part of a land surveying project. Including it in your services helps explain the cost of the project. At the end of the project what does the client get to keep? Will there be stakes marking their property? A copy of the title documents you collected? Do they get CAD files, hard copies, or both? How many copies will you make? These are important to specify up front and in writing because costs can add up when a client wants six printouts of the title history or full-color aerial shots. Make sure to specify file formats as well so they have an opportunity to ask for other formats early in the project. If you are specific with your deliverables, when a client wants something more or different, you can go back to the proposal and use it to explain to them what the additional cost will be to fulfill their new requests. Now you can meet their needs, without erasing your profit margins. Once you have written the project description and deliverables, go through them and tally up the cost of everything mentioned. 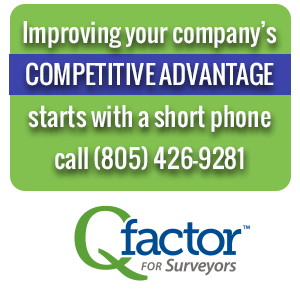 The golden rule for preparing estimates is: use real numbers. Never eyeball an estimate because if your costs come in way over or way under estimate you risk losing the confidence of your client. Instead take the time to do the research. If you did a similar project a year ago, dig into those files to figure out just how long it took. Yes, it takes time to prepare a solid specific proposal, but it can save you enormous headache down the line because it serves as clear documentation of what you and your client agreed upon. There are ways to make proposal writing more efficient by creating templates for common types of projects your firm takes on. You can also invest in proposal building software. If you are already using Qfactor for Land Surveyors as your project management app, Proposal Builder add-on will easily integrate into your existing system. This add-on allows you to create templates for your service types, build estimates with pay and billing rates pulled from QuickBooks, and attach the necessary attachments and exhibits. It makes the research process easier because you don’t have to open multiple applications to find the information you need. Then it emails a signable pdf you to your client and automatically populates data fields in various programs once that proposal is accepted.